Astrology is one such subject that has always been a driving force for me. The realms of astrology in regard to research have always offered something new and intriguing to delve deeper into it. Despite my passion for the subject, the opportunity that it provides me to interact with different sets of new people every day is what interests me. These every day interactions provides me with new visions that helps me to strive further in pursuing Astrology as a career. 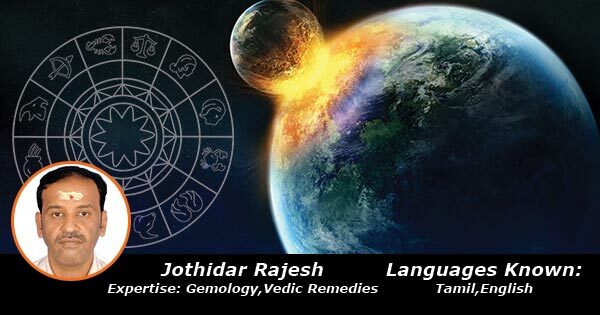 Although my responsibilities includes analyzing horoscope and consultation, my experties lies in implementing Vedic remedies, Tantric remedies, Gemology and Numerology. Most of my clients are satisfied with ability to identify and evaluate complex problems with effective remedies and solutions. So far, I have consulted a number of families and addressed their problems with effective remedies. My strong ability of using my logic and reasoning in identifying the strength and weaknesses of my clients have always been helpful in providing my clients with satisfactory remedies that have helped them throughout. People from all walks of life have contacted me for consultation for solutions and remedies to attain remedies, solutions and success in their life. I was born in Porur in the state of Chennai in South India in the year 1972. I have a working experience of 15+ years in astrology consultation at World Phone India Pvt Ltd. Prior to this, I have also worked as a consulting astrologer for suggesting lucky stones at Jaipur Gems and astrology. I am a patient listener and pay minute details to every conversation I have with my clients. This helps me in the proper understanding of the concerns of my clients which further helps in providing alternative remedies and solutions or approaches that can effectively address the problems.